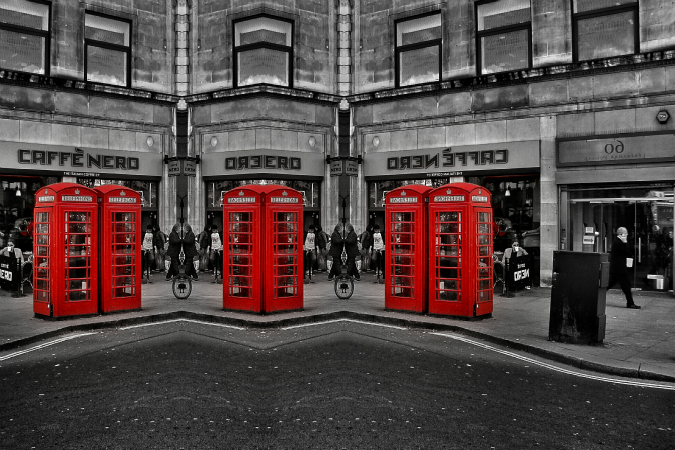 This is a photograph of telephone boxes near Trafalgar Square in central London taken on Sony DSC-H50. The original (1) was a pretty bad picture, so I decided to see if anything could be made from it. The first step was to use colour splash, leaving only red (2), for which I used Pixlr Express on Android. I used Photo Editor (dev.macgyver) mirror effects to create the following two images (3) and (4), based on image (2). Then it was silly season for editing. Images (5), (6), and (7) are variations on image (2), using Snapseed and Aviary (both Android apps), and (8) was another mirror effect on image (4).